Established in 1959, Boats Incorporated is an award-winning boat dealership and marina located in Niantic, CT.  Boats Inc. sells Grady-White, Parker, and Sportsman branded boats as well as YAMAHA outboards. The facility also includes a 175-slip marina which gives boaters access to some of the best fishing grounds in the Northeast. We are open 7 days a week and for 60 years have been committed to providing you and your families the absolute best customer service in the industry. We also always have a nice selection of “previously enjoyed” boats for sale on-site. We are one of the few dealerships in Connecticut to be Marine Certified. We also have consistently been part of Grady-White’s Admirals Circle, a YAMAHA Best in Class Dealer in the Northeast, one of the YAMAHA Dealer Council Members, and a Parker Marine Customer Service Award Winner. If you have any questions, please don’t hesitate to reach out to us at 860-739-6251.